Join us by enrolling in the Confraternity and Union of the Precious Blood. Enrollment is open to both living members and departed loved ones. One year, Perpetual, and Family memberships are available to living members. Enrollment is $10.00,$15.00, and $30.00. One year and perpetual enrollment to our cloisters' purgatorial society for departed loved ones is $5.00 and $10.00 respectively. To enroll, simply mail us your completed enrollment form which is linked below. 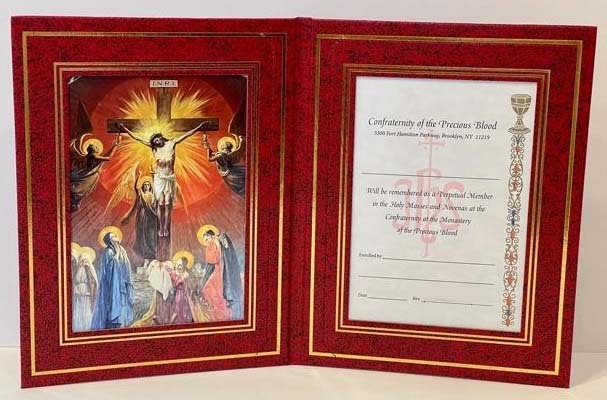 This certificate bestows the Priviledge of Sharing in the merits of the DAILY PRAYERS, PENANCES, and NIGHTHOUR of REPARATION of our CLOISTERED SISTERS and of the HOLY MASSES and NOVENAS offered up under the Auspices of our CONFRATERNITY at the MONASTERY of the PRECIOUS BLOOD.